Germantown Avenue, a major commercial route since colonial times, cuts diagonally across the service area of a modern, nonprofit, community development corporationAsociación de Puertorriqueños en Marcha (Association of Puerto Ricans on the March, known as APM). During the 19th and early-20th centuries, factories and shops lined this stretch of Germantown Avenue. Block after block of working-class row houses were built on the grid of streets that overlays the narrow old avenue. Because Germantown Avenue had served as an economic anchor for the neighborhood, this community's struggle with 20th-century economic disinvestment was particularly difficult. By the 1970s, no major employers, institutions, or retailers remained in the community; and between 1980 and 1990, population dropped by 25 percent. Community demographics had changed during the late 20th century, as whites moved to other parts of the city or to the suburbs, and African-Americans and Latinos moved into this neighborhood. By 1990, 44 percent of the neighborhood population was Latino, compared with six percent citywide. The median income in the neighborhood was about half that of the median income citywide, and unemployment was high. As businesses on the avenue closed and buildings were abandoned, the community was left with no center of economic strength. And what might appear to be easy accessibility to other neighorhoods is somewhat compromised: (1) The community is near Temple University, but is separated from the campus by a railroad viaduct; (2) Although the neighborhood lies between Philadelphia's two major subway lines, neither is within easy walking distance. 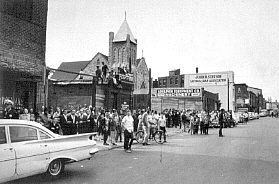 Crowds on Germantown Avenue, May 13, 1963.